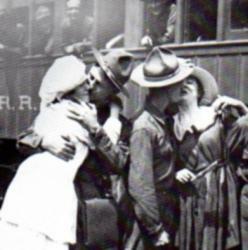 Bidding farewell to loved ones before heading off to the front is no easier today than it was 100 years ago. Much attention and honor is given to the active duty and retired service member, but the families who have "kept the home fires burning" deserve our respect and admiration as well. We'll give them their due at our next monthly program, THE LIFE AND TIMES OF A MILITARY SPOUSE. Tuesday, February 19, 7 pm at St. Mary's Episcopal Church, 10630 Gravelly Lk Dr SW in Lakewood. Speaker TBA. As a bonus, local author Joan Brown's book, "MOVE--And Other Four Letter Words", in which she relates her life experiences as a military spouse, will be available for purchase at the program. *PLEASE NOTE: due to a scheduling conflict, this is a different date than the one posted in our Winter 2015 newsletter.